The legend of Ned Kelly looms large for all Australians, and it was especially familiar to those who grew up in the first decades of the twentieth century, hearing stories of the Kelly gang’s notorious exploits in north-eastern Victoria, the dramatic siege at Glenrowan, Ned’s eventual capture, trial and sentencing to death, all of which had occurred less than a generation before. Kelly’s famously philosophical last words – ‘Such is life’ – have also gone down in history. The son of a Melbourne tram driver, Sidney Nolan would have been familiar with the Melbourne gaol where Kelly was hanged, and had no doubt seen his startling hand-forged armour fashioned from pieces of farm machinery which was on public display. Nolan also had a more direct connection to the story of Ned Kelly. His grandfather, a policeman in north-eastern Victoria, had been involved in tracking the bushranger and his gang, and Nolan was also familiar with ‘Kelly Country’, having visited relatives who lived in the lower Goulburn valley from a young age, developing a love of the surrounding landscape. Nolan embarked on a second major series of Kelly paintings in the mid-1950s, by which time he had settled in England. The theme had lost none of its power during the preceding decade and Nolan produced an inspired series of paintings that showed him as a confident, innovative and highly accomplished artist. The critical response to paintings exhibited at London’s Redfern Gallery in May 1955 was unanimously positive and institutional recognition soon followed with the purchase of After Glenrowan Siege, 1955 by the Museum of Modern Art, New York. Two years later, the Tate, London, acquired Glenrowan, 1956 – 57 from Nolan’s first large-scale survey exhibition at the Whitechapel Gallery. Organised by the Arts Council of Great Britain this exhibition subsequently toured the country attracting huge crowds and in conjunction with the Tate acquisition, consolidated Nolan’s standing in England as well as adding to his growing international reputation.11 Paintings from the second series are also represented in numerous important public and private collections in Australia including:Kelly Crossing the Bridge, 1955 (National Gallery of Australia, Canberra), Ned Kelly, 1955 and Kelly, 1956 (Art Gallery of New South Wales, Sydney), Kelly with Horse, 1955 (National Gallery of Victoria, Melbourne) and After Glenrowan Siege no. 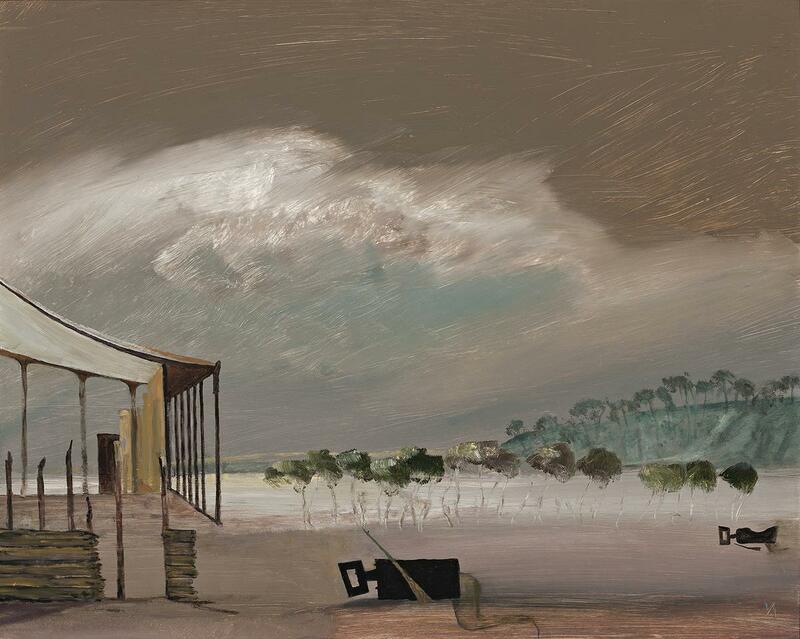 2, 1956 (TarraWarra Museum of Art Collection, Victoria). In Glenrowan, painted in September 1955, we see Nolan’s reprise on The Glenrowan Siege, 1955 (Kerry Stokes Collection, Perth), a work he had included in the successful Redfern exhibition four months earlier. The Glenrowan Siege depicts Ned Kelly mounted on horseback looking at the burnt-out hotel at Glenrowan, the site of the final battle where several of his party were killed and he was finally apprehended and arrested. Surveying the destruction, Kelly is part of a complex scene, varied in colour and visual detail, in which the presence and activity of humans and the natural environment are equally weighted. The familiar narrative also seems close by. Glenrowan, by comparison, uses a limited palette and minimises pictorial detail, emphasising the landscape in a taut and yet poetic depiction. Dominating the composition, a vast grey sky painted with turbulent brushstrokes and highlights of blue and white, pushes down on the scene below, while a green treed hillside on the right leads the eye into the far distance across bare flat ground. The scene is framed on the left by the ruins of the hotel and in front of a horizontal band of trees, two prone armour-clad figures punctuate the central and far-right foreground. Despite the rifle of the central figure being firmly raised, he appears to have begun to merge with the landscape, the black metal of his mask and armour a stark reminder of his once vital presence. In this painting Nolan is less interested in telling a story, wanting instead to say something about man’s place in the world. 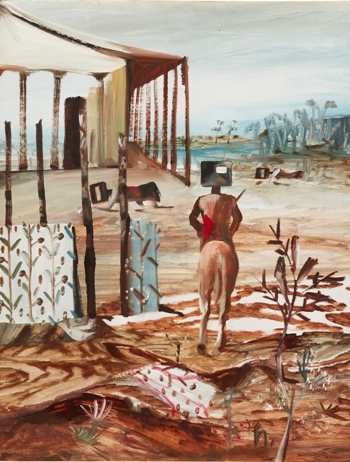 A lyrical expression of what Patrick McCaughey describes as the ‘tragic grandeur’ of the 1950s Kelly paintings, Glenrowan, 1955, presents Kelly as more human and less heroic, a reflection perhaps of the mature artist who admitted that he used the figure of the bushranger as a ‘shorthand’ for his own emotional state. Combining Kelly, one of Nolan’s most important and enduring subjects, with a representation of the landscape, timeless and sublime, this painting is a beautiful and enigmatic statement by one of Australia’s most significant twentieth century artists. 3. Of the 27 paintings that comprise the first Kelly series, the exception to this is First-class Marksman, 1946 (Art Gallery of New South Wales) that was painted at Stonygrad, the Warrandyte home of Danila Vassilieff. See Pearce, B., op. cit., p. 35. Sunday Reed gifted the paintings made at Heide to the Australian National Gallery, Canberra (now National Gallery of Australia) in 1977.